When Thanksgiving rolls around, it's time to break out the holiday coloring sheets. Your kids will enjoy working on these Thanksgiving coloring pages, free to print, and the activity will keep them occupied while you prepare your holiday feast. You can print each of these original pages for free, so treat your kids to a new box of crayons, and let them color to their hearts' content. A yummy Thanksgiving feast, two cute pilgrims, and one plump turkey all add up to a lot of holiday coloring. Whether your family is big or small, kids will have fun with these Thanksgiving free coloring pages. When the kids are finished, you can let them hang their artwork around the house for decorations. Just click on the pages you want to download, and print them out. If you need help downloading the printables, check out these helpful tips. This cute coloring page features a smiling turkey and some festive pumpkins on the side. Print this free turkey coloring page for Thanksgiving fun. 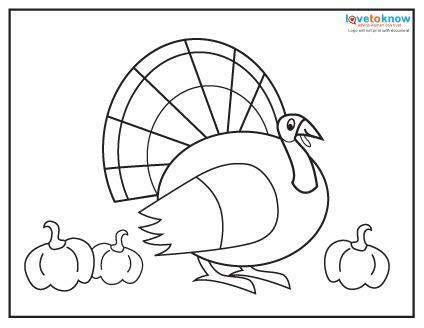 Use it to play Pin the Feather on the Turkey: Once your kids color this page, and can use it to create a fun Thanksgiving game. Give your kids feathers (these are often available at craft or dollars stores) and have fun with a twist on the traditional Pin the Tail on the Donkey game. Blindfold each child and let him or her try to place a feather or feathers as close as possible to where it should be located on the turkey. You can use a single color feather for each child. Don't have feathers on hand? Just have kids cut feathers out of construction paper to play the game. Use it as the first page of a Thanksgiving book: Many kids love to come up with their own creative stories, and there's no end to the ideas when it comes to Thanksgiving. Staple blank sheets of paper to the back of the coloring page and let your kids write or journal as much as they want. Use it as a math learning tool: You can also use this as a math learning tool for young children, and there are couple ways to do it. For very young counters, just asking simple questions, like 'how many pumpkins are on the page?' will work. You can also create simple math problems by instructing to kids to alternate colors of the turkey's feathers (such as brown and orange), and then asking problem-solving questions such as, how many orange feathers are there all together? How many brown and orange feathers does the turkey have? Get creative with craft supplies: If you're looking for a way to use up odds and ends of craft supplies, this is the perfect opportunity. Round up remnants of glitter, paints, craft pom-poms, or whatever is left in your child's craft bin as the year closes in and let them get as creative as they want decorating this turkey and his feathers. Kids can color this adorable Thanksgiving dinner coloring sheet, but it has other uses, too. 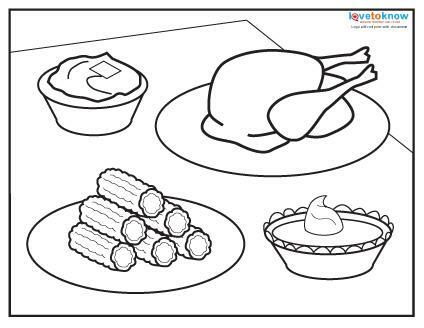 Click to print the Thanksgiving dinner coloring page. Use as placemats: Looking for a way to keep your Thanksgiving tables clean and add a fun and festive touch to Thanksgiving dinner? Just use these cute coloring pages as disposable placemats. 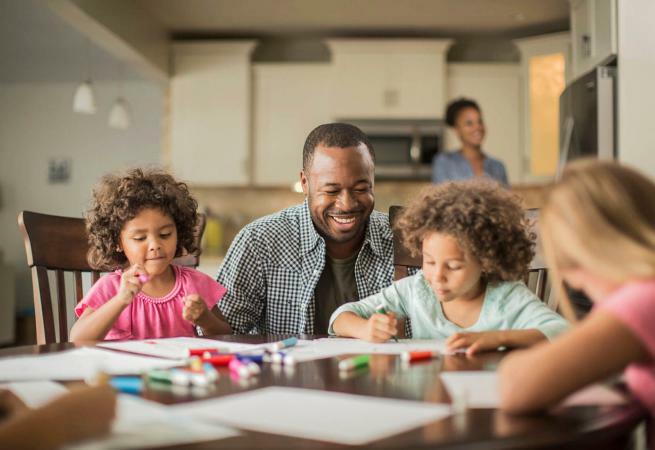 Kids can color them in advance (and you can label them if you have planned seating arrangements). If you are having a more formal place setting for adults, use these as placemats for the kids' table and place a basket of crayons in the center of the table to keep them busy while you finish the meal preparation. Talk about nutrition: You can also use this as a learning tool to talk about nutrition. The fact that the protein and vegetables are the largest portions can be a good starting point to talking about how things like sugars, fats, and carbohydrates shouldn't make up the bulk of what you eat. Make 3-D Thanksgiving pictures: This coloring page could be a fun use of 3-D renderings with simple things you already have around the house. For example, give the kids cotton balls to glue to the page as the whipped cream on the pumpkin pie, or let them use puffy pain to recreate the corn kernels. This free Pilgrim coloring page can be used around Thanksgiving time for fun of education purposes. Click to print the Pilgrims coloring page. Use as a teaching tool: Whether in the classroom for a Thanksgiving party or at home, this coloring page can be a start to talking about the history of Thanksgiving. You can make a simple teaching booklet with this as the cover, and have each page involve simple questions or facts about the origin of Thanksgiving. Use as a pattern for felt play: Many children love to act out scenes with felt cut-outs, and you can use these as patterns to make Pilgrims out of felt. Discuss the history behind Thanksgiving or read a good Thanksgiving story, and then let the children reenact or come up with their own Thanksgiving scenes using felt cut-outs of the Pilgrims. Hand out as an invitation: The cute layout of these Pilgrims is ideal as an invitation. Have children color them and then use them as an invitation for Thanksgiving dinner or dessert, or for a Thanksgiving party. You can print off a separate sheet and add details such as time on the back, or just write them by hand. Coloring pages offer a great way to encourage kids' creativity, and they also provide young children with an easy way to become involved in the festivities of the season. Go ahead and print out some of these free pages, and give your children a fun way to pass the day until it's time to sit down for your Thanksgiving feast. If you need a coloring page for colder weather, check out these fun winter-themed coloring pages!